lDivorce: There is an inference that one man who left to look for work has abandoned his family; and one character mentions "his first wife" in passing, but that's it. 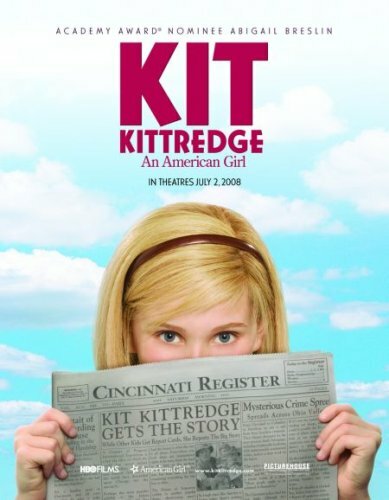 Let’s get one thing straight up front: Kit Kittredge, despite the unfortunate sub-monicker of “An American Girl”, is not a chick (or, if you will, a chicklet) flick. This is a wonderful movie for the entire family, with nearly as many boys as girls in the story, a mystery to solve, and enough pathos and empathy to make Oprah weep. Plus, how could a film starring Stanley Tucci, Joan Cusack, and Colin Mochrie not be excellent?? That said, the American Girls franchise has done such a great job of disenfranchising boys – and completely turning them off – that I had to drag our son kicking and screaming to the theatre (it helped when I told him that the start, Abigail Breslin, was the same girl from Nim’s Island, which he also really liked). But once he got there, he really liked the movie. There are a few storylines that run throughout Kit Kittredge. It’s the depression, and people are losing their jobs, and their homes. Husbands are leaving to find work elsewhere. Hobos (homeless people) are looked down on, and villified, often unfairly. And amidst this all, young Kit Kittredge wants to be a newspaper journalist. As if that isn’t enough to hold your attention, when Kit’s mother starts taking in boarders to make ends meet, a mystery develops. And that really is all I’m going to tell you. You really should take your sons, daughters, or both, to see this movie. I promise that you’ll be glad that you did, and that you’ll enjoy the movie too. It’s rare that I would be willing to go back to see the same movie twice at the theatre – this summer has given us a double-dose of rarity with both Kit Kittredge, and Wall-E.